What makes an efficient heating system? Homeowners are telling us that choosing an efficient heating system is more important than ever before, with low running costs and low energy consumption being the key factors in choosing an underfloor heating system (UFH) or integrated renewables solution. With this in mind, what do you need to consider to make a truly efficient heating system? A good design and supply company will always specify and design an efficient and bespoke system that is well suited to the property and the homeowner’s lifestyle. For every system the bespoke design should be based on heat loss calculations for each individual room (one room could have three external walls, meaning a higher heat loss than another with just one external wall), and early recommendations may be made to improve the system’s efficiency – so you can be confident that the final design will result in a system that will perform. Find out more about what makes a good UFH system design in this blog post. Because the emitting area for UFH is large, sufficient warmth is provided across the whole floor surface to heat the room effectively. And, because UFH uses far lower water temperatures than a radiator system, the heat source doesn’t have to work as hard to reach higher temperatures and makes the most of a boiler’s condensing mode, so it operates much more efficiently, meaning lower annual running costs. UFH works with gas, oil and LPG boilers as well as ground and air source heat pumps. The lower flow temperatures required for UFH make it an ideal partner for heat pumps, which provide optimum efficiency at low temperatures, therefore reducing the cost of heating. Insulation is extremely important when installing a heat pump – the more insulation, the less heat that is lost. When paired with a modern condensing boiler, UFH is approximately 25% more efficient than radiators. Controlling a heating system remotely is now an option offering great flexibility as well as reduced running costs. Remote access to heating controls ensures that rooms are heated only when needed. 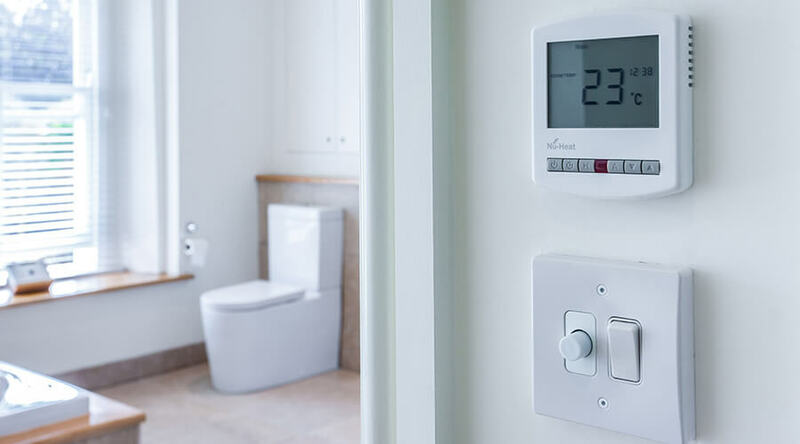 Thermostats can be installed with UFH in each room, meaning individual room temperatures can be independently controlled from one single Smart Control – or even a smartphone. The flexibility to control room temperatures separately enables ‘fine tuning’, giving perfect comfort with improved system controllability. You can find out more about the control options for UFH on our thermostats page. The introduction of the Energy Related Products Directive, or ErP, means that all new heating systems will now come with a product and package label to give a clear rating of their energy efficiency. Its purpose is to make the efficiency of heating products easier to compare, helping homeowners and installers to make informed and eco-friendly decisions. Nu-Heat provides system package labels for all of our heat pump and solar systems. You will see the product and system fiche information as well as the energy label for the package in every quote. The label will also be printed and included in the handover pack with the customer user guides. 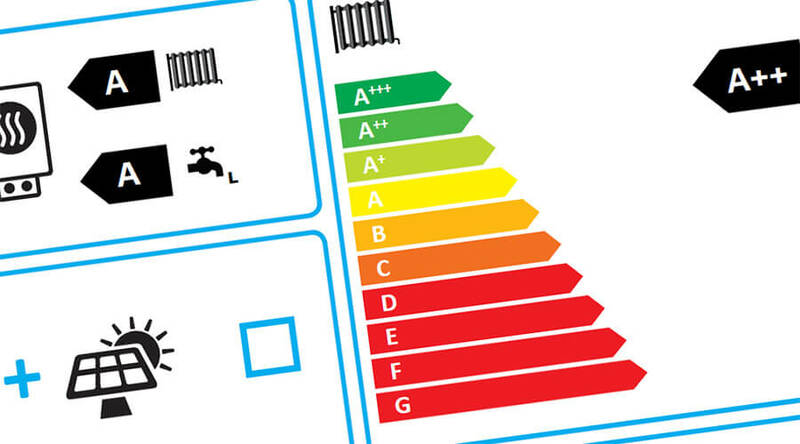 If you are installing our UFH in a project, the energy label for the heating package will be calculated and provided by the installer – this is because they have all of the relevant information on the heat source, thermostats and any other components. It’s simple for an installer to calculate and generate this label themselves and we have produced all of the required forms and an instructional video, available on our ErP resources page. The importance of system design, installation and commissioning support should not be underestimated when choosing an UFH system or integrated renewables solution – they provide the installer and homeowner with peace of mind that the system is being handled by experts and will perform as expected. Our team will be happy to discuss or advise on an efficient UFH & renewables heating system for any upcoming projects. Call us on 01404 549770, 8am – 5pm, Monday to Friday.